‘Fifteen new recordings of classic songs’ – that’s what the front cover states, so far, so good. What it doesn’t say is how excellent these new versions are. Recorded in ‘Cowboy’ Jack Clement’s The Cowboy Arms Hotel & Recording Spa in Nashville the sound is excellent. What we get is mainly John Prine and his finger-picked acoustic guitar at his best, augmented by a select cast of uniformly accomplished musicians (just listen to Angel from Montgomery) on the usual instruments in that Singer-Songwriter/Folk/Country context (electric guitars, bass, mandolin, fiddle and accordion and so on). All very well and nice to have, but that wouldn’t count for much, wouldn’t he write such damn good songs. I don’t own all of his records (yet) so I can’t say which songs he left out I would have loved to have on here as well – apart from one and that is Daddy’s Little Pumpkin (from The Missing Years), given that that version is already so perfect maybe it’s better it isn’t done here again. As far as I’m aware, it’s note one of his most popular songs, but it is my favorite. The album starts with Souvenirs (from Diamonds in the Rough), setting the course of the album nicely, his gravelly voice, a lovely acoustic guitar only backed by an electric guitar and a little bit of bass and mandolin – the sound as pure and clear as a fine winter morning. Next song Fish And Whistle (from his 1978 album Bruised Orange) features some fine accordion backing, and is one of the more Country-influenced songs on Souvenirs (together with Grandpa Was A Carpenter and Please Don’t Bury Me). Far From Me (from the first, self titled album) which was also recorded by Justin Townes Earle on Broken Hearts And Dirty Windows in a mighty fine version, but the version on here is far more melancholic, which suites the lyrics of the theme better. It’s about a couple going through something of a rough patch (‘…. Well. Ya know, she still laughs with me But she waits just a second too long…’), but the way the song is set (with him picking her, a waitress, up at the end of her shift) is one of the best examples of Prine’s songwriting capabilities – it just begs to be given a cinematic treatment, at least I can imagine a short film/music video version perfectly well. Next track Angel From Montgomery, which I was familiar with from a radically different, but excellent version by Canadian outfit The Leslie Spit Treeo (anybody remember then? ), is a slow ballad, augmented by the lovely interplay between pedal steel guitar and mandolin. The following Donald & Lydia is another prime example of why Prine is regarded so highly as a songwriter, the lyrics mirroring American small-town life perfectly, it’s about a would-be couple that tragically never meet in real life although they only live a few miles apart and are both dreaming about finding love (‘They made love in the mountains They made love in the streams They made love in the valleys They made love in their dreams But when they were finished there was nothing to say ‘cause mostly they made love from ten miles away’) – how touching is that? Grandpa Was A Carpenter is an old-timey Country tune with a prominent fiddle and suitably rustic, old-style lyrics (‘Well he used to sing me ‘Blood On the Saddle’ And rock me on his knee And let me listen to the radio Before we got T.V. Well, he’s drive to church on Sundays And he’d take me with him too Stained glass in every window Hearing aids in every pew…’) – proving that he can do both sad, melancholic and upbeat, good-natured songs equally well. The Late John Garfield Blues is another highlight for me – slow, quite melancholic and with a lovely tune, one of his finest songs if you ask me. 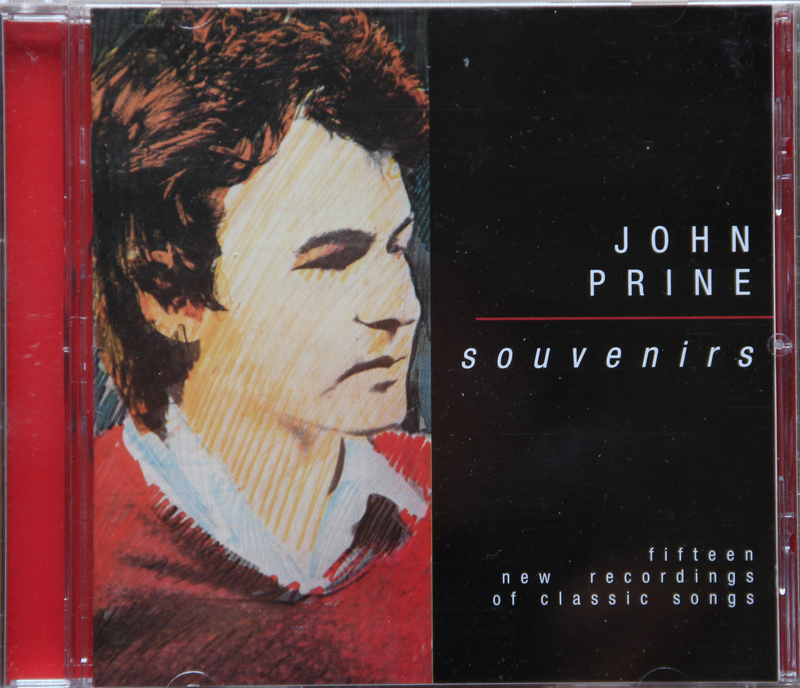 But it’s next song Blue Umbrella, which I probably love best on here – just John Prine, his voice and a picked acoustic guitar – actually pretty much the only things he needs to sing his songs write into my heart. Six O’Clock News is one of the saddest songs on here, telling the sad story (‘… The Whole town saw Jimmy On the six o’clock news His brains were on the sidewalk And Blood Was on his shoes…’) of young James Lewis, son of Wanda, and it’s also one of the loveliest arranged one, I very much like the interplay between the electric lead guitar, accordion and piano. Well, what’s to say about Sam Stone? Another, and probably, if I am informed correctly, one of his best known songs (covered by the likes of Johnny Cash) about a war veteran (most probably from the Vietnam war), coming home with military accolades, but also an addiction to morphine which ends with his overdose – not very surprising it was/is so popular in the US, very sad indeed – I am especially moved by the line (‘… While the kids ran around wearing other People’s clothes…’), a great song, that. Next to last song Please Don’t Bury me is another slightly faster and good-natured song with a ueber-catchy chorus. I have to admit that I actually like the version on his first album of album closer Hello In There a tad better – an excellent song and the lyrics are a very good example of his maturity in both outlook on life and as a songwriter, even at an early stage in his career (he was only in his mid-twenties when that album was released in 1971). A lot of catching up for me left to do I guess, when it comes to his work, as I only own this album, The Missing Years and the first album so far. This entry was posted in Music and tagged Country, Folk, John Prine, Nashville, Roots music, Singer/Songwriter. Bookmark the permalink. Thanks, there’s quite a few albums of his I have to check out still. But country twang sounds good.